Before starting with a simulation you should once check the program preferences from the menu Setup / Preferences. The preference dialog as show by the screenshot below allows to setup the computation options and switch on and off user prompts. The computation options define the number of threads used for calculations on the local CPU as well as which GPU device to use. By setting the number of CPU threads to 0, the calculations will be performed on the GPU alone if selected. Nevertheless, one CPU thread is still running to post-process the data produced by the GPU. Multi-thread calculations of transmission functions will run on the selected number of CPUs only. At minimum one CPU thread will be used in any case for managing the calculation and another one for performing the multislice if no GPU device is selected. At maximum you can select as many CPU threads as available CPUs on your system. However, it is highly recommended to leave a few CPUs free for the system and manager threads. 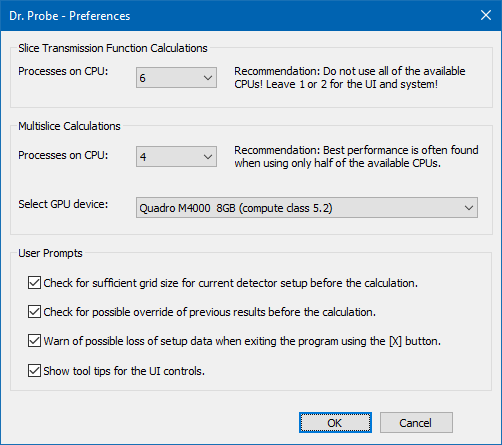 Start with 2/3 of available CPU threads and increase stepwise if the CPU load is far from 100 % during a calculation (check with task manager). GPU devices supported by the runtime provided with Dr. Probe will be listed in the respective drop-down list. The list displays the device names, total device memory in GB and the device compute class. Multiple device computing is currently not supported, only the selected device will be used. Setting the GPU device to "None" means, that the calculations will be performed on the CPU only.